The building blocks to a Claude landscape consist of the lone tree, the tower, the antique edifice, the distant mountain and—whether in the foreground or background—a river, stream, or sea. Brought together in a geometric assembly in new and different ways, these compositional elements created the foundation of landscape art for eighteenth century Great Britain. Claude’s compositions introduce a classical aesthetic to landscape art. Its form and structure lead it to the category of picturesque due to the “pleasing display of the beauty of nature […] imbued with a quality of subtle suspense” (Sonnabend and Whiteley 15). The peasant figures in a Claudian landscape convey a narrative, with the slightest amount of emotion expressed through gesture, body language, or physiognomy. Claude’s composition “incorporates the drama of his stories […] and the viewer experiences it all the more intensely the deeper the immersion into the scene” (Sonnabend and Whiteley 16). Combine the narrative of figures with the visually appealing landscape that surrounds them and you have the fully assembled picturesque composition. Claude’s drawings use “pen and wash and a habit of enclosing the central action in his compositions with rocks and trees, like a flat stage-set” (Whiteley 57). The influences of the ‘flat stage-set’ are evident in the works of the Flemish artist Paul Bril, who was a follower of Claude’s one time employer Agostino Tassi, and Bartholomeus Breenbergh. 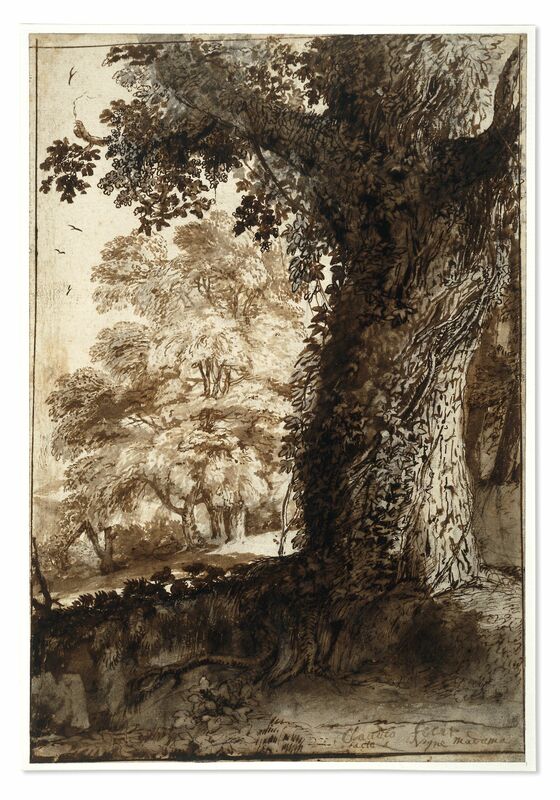 Breenbergh’s manner of “conveying abrupt contrasts of sunlight and shadow by applying washes of varying density over detailed drawings in sharp pen” was a method applied by Claude. According to Whiteley, Claude could have inherited the style of picturesque landscapes from Herman van Swanevelt. Swanevelt was known for “drawing imaginary landscapes with dense pen strokes applied in the manner of etching” (Whiteley 57). The atmosphere Claude created within his landscapes is due to his interest in the effect of light in trees and along riverbanks. His drawings concentrated on the “middle distance and beyond” while the foreground was highlighted by the flat smooth grass, tree trunk, and strategically placed rocks and ruins of his pictorial scene (Whiteley 58). It was evident in Claude’s Liber Veritatis, the book in which he recorded his landscape compositions, the impact of the Claudian landscape is seen through English landscape gardening depicted in paintings. The English garden was “asymmetrical, informal, varied and made of such parts as the serpentine lake, the winding drive, and the winding path, the trees grouped in clumps, and smooth lawn,” (Pevsner 164). These are all elements derived from Claude’s composition. The importance of ruins in English landscape gardening was borrowed from Claude’s example and held in such high opinion that the British public began to erect buildings resembling those seen in Claude’s drawings, paintings, and prints. The element of taste expanded to feature items in and around the home—a large room, lake and trees—that resembled the picturesque composition by Claude. The British have used the Claudian landscape to create a picturesque theme throughout urban dwellings and the countryside. Pictorial landscape composition grew to be considered a style of the highest form due to the perfection Claude created combining nature and the ideal. This composition was one that remained influential for many centuries to come.